Many families throughout Mount Pleasant and Charleston dream of owning their own homes, however the process of purchasing one can seem intimidating and at times overwhelming. Lucey Mortgage Corporation has worked closely with local South Carolina families for 27 years to help make the process of owning a home as smooth and as easy as possible. Purchasing a home is the biggest commitment you will probably ever make so you need to be sure you are ready to transition from renting to buying. Potential buyers with stable jobs, reliable income, manageable debts, and a desire to settle in one place for a while are prime candidates for homeownership. If you have doubts or concerns in any of these areas, we are here to answer any questions you may have so that you know you are making the best decision for you and your family. Now that you know you’re ready to purchase a home, you will want to look at your budget to get an idea of how much you can spend on a home. The housing, or front-end ratio, is a general rule of thumb that states your housing payment should not be greater than 28 percent of your total income. Keep in mind that this is just a rule of thumb and affordability will vary depending on each buyer’s unique situation. Potential home buyers should focus on maximizing their credit score prior to applying for a loan. This can help a borrower obtain the best interest rate possible. Saving as much as possible for a down payment can also help to lower your monthly payment and improve loan terms. Private Mortgage Insurance (PMI) can also be avoided with larger down payments which may be required with smaller down payments and certain loan types. Once your finances are in order, it is time to consider pre-qualification and pre-approval. Pre-qualification involves analyzing your debt, income, and assets to provide a general idea of what you should be able to afford. This is a fairly informal process when compared to pre-approval. It is important to note that pre-qualification is an estimate only and not a guarantee that you will receive a mortgage of the same amount. Pre-approval is a much more detailed process than pre-qualification. At this point you will need to complete a formal application. This involves submitting various documentation such as pay stubs, W-2 forms, bank statements, and credit and debt information for review. Once your information has been submitted and reviewed, you will receive a written commitment for an exact loan amount. At this point, you have a guarantee for a loan and can begin to make offers on a new home! Having a pre-approval can be a powerful tool when making offers. Sellers are much more likely to accept an offer from someone with a pre-approval in hand. Uncertainty and doubt can be created in the mind of the seller if a buyer is without one. If a seller accepts an offer from a buyer and they do not get approved for a loan, there can be lengthy delays. Pre-approval will expedite the entire sales process. Once a seller accepts your offer, you are ready to close on your new home! Whether you are looking for a home in Mount Pleasant or Charleston, our goal at the Lucey Mortgage Corporation is to make your dreams of homeownership come true. 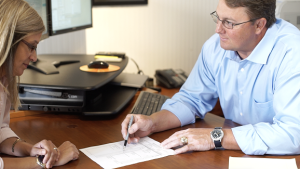 If there are any questions you have about the home buying process, please contact us today!